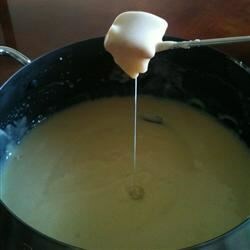 "Your fondue party won't start hopping until the cheese starts melting. Get busy with this easy, basic Cheddar cheese fondue! It's perfect with pieces of bread or vegetables." Make this classic, creamy Swiss fondue with the shredder of your food processor. Very good. I used half & half in place of milk, used half cheddar, half mexican blend, added a splash of white wine. Delicous.